If It's Too Loud...: Evening Bell - "Tail Light"
You don't usually think of Seattle and country music going together. Seattle is typically loud, and even when grunge was considered groundbreaking it was still grounded in classic psychedelic rock. And it's dark. Seattle bands just sound dark as hell. 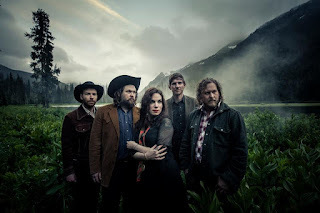 Well, Evening Bell are a country band from Seattle. And, since they're a country band in Seattle, it's dark country grounded in psychedelic classic rock. Also, Caitlin Sherman, one of Evening Bell's main singer/songwriters, brings her fascination of film composition to the songs, giving them this grand and majestic cinematic quality. Most country in 2016 either falls into the mainstream bro country or a complete throwback to classic country. Evening Bell are the increasingly rare blend of country that sounds completely fresh and unique. Evening Bell's debut album, Dying Stars, will be released August 12. You can watch the video for "Tail Light" below. For more information on the band, check out their website and Facebook.